Linda Fox, President of the Ellis Co. Historical Society, made a trip to Oklahoma City. While there, she and her husband were able to view "The Guardian." 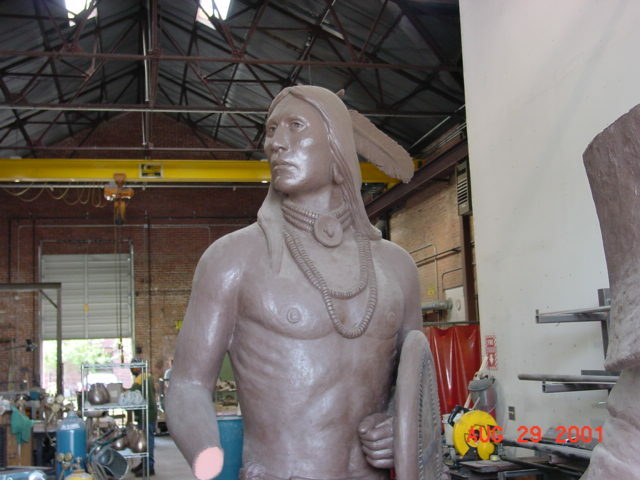 This is the statue that will sit on top of the Oklahoma State Capitol dome in Oklahoma City. 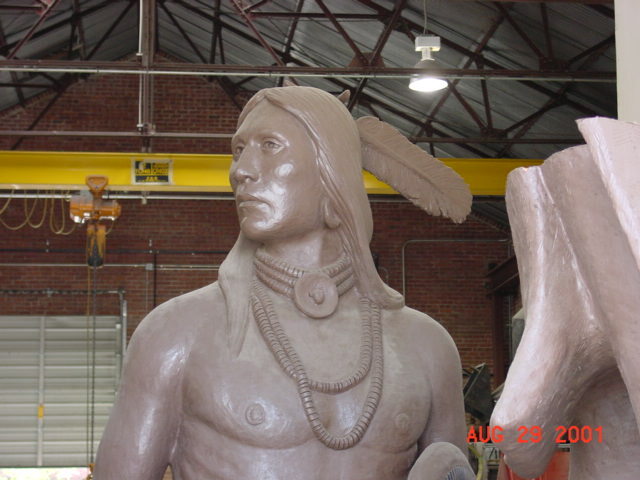 The Guardian is being sculpted by State Senator Enoch Kelly. Photos provided by Linda are shown in thumbnails. Click on photo for larger view. The Oklahoma State Capitol and Its Dome. OKLAHOMA CITY--A steady flow of people came to the Oklahoma State Capitol Saturday for the chance to get an up-close look at the statue that will top the Capitol dome. Randy Stark of Oklahoma City brought his two sons for an opportunity they would never have again. Most of the onlookers were impressed With the 17-foot bronze statue, which will be hoisted to the top of the dome Friday. 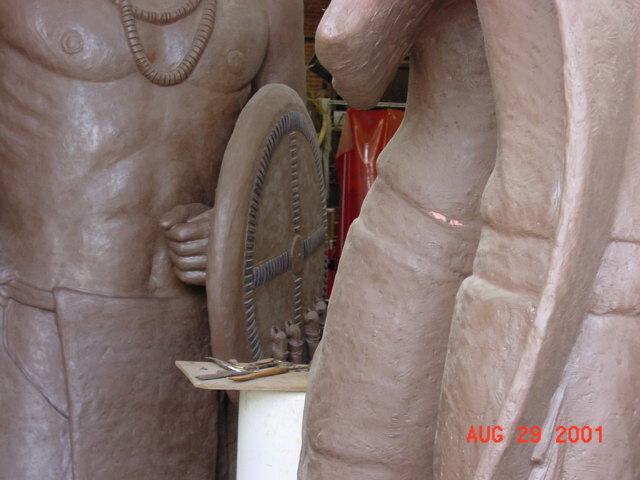 Saturday was the first day the public could view the statue up close. Mary McGuire drove from Chandler to see it and will also visit next Friday. I love it, McGuire said. Its great. It resembles Oklahoma and it resembles peace. McGuire said a better piece could not have been selected. You can tell its a great piece of work by how many people are here to see it, McGuire said. 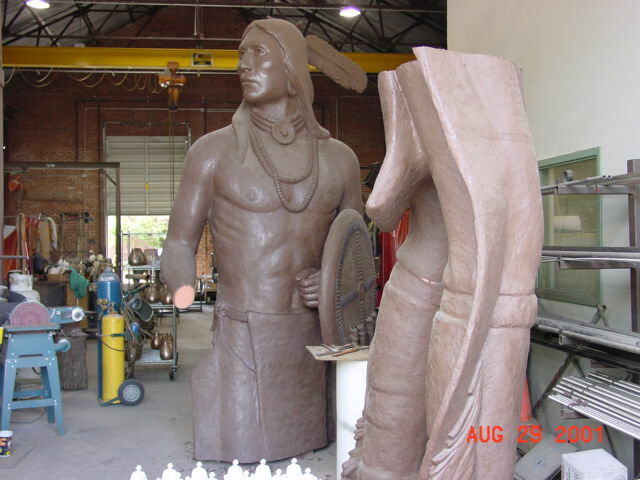 The Guardian, which is the name of the statue, has a total weight of 5,980 pounds and a total height, including the lance and berm, of 22 feet, 9 inches. It took 3,000 hours, 300 linear feet of welding, 4,000 pounds of bronze and approximately $300,000 to create. OKLAHOMA CITY --The Guardian has taken his post. And his creator told a crowd of 4,000 on hand to see the 21 -foot-tall statue lifted atop the new State Capitol dome that he wont soon leave it. My lance pierces my legging and is planted in the ground, said Sen. Kelly Haney, the sculptor, as if speaking as The Guardian. I will not be moved from my duty, from my love of Oklahoma and all of its people - people who have come from far and near, people who have withstood adversities and hardships, and still stand strong and proud. He may be there to stay, but it took him an extra 45 minutes Friday to get into position. A tower crane lifted The Guardian to within a few feet of his perch atop the dome's cupola right on schedule Friday morning. But the choker cable connecting the sling around the statue to the cranes cables was too long and the crane couldnt lift it high enough to get it into place. They brought it down, changed cables and lifted it back up again. At 11:27 a.m. dome construction superintendent Ken Smith proclaimed The Guardian is set, as project director John Jamison, Gov. Frank Keating and members of the media listened in on a walkie talkie. Keating returned to the podium and microphone and announced that the statue was officially in place, but few people were still around to hear him. And even fewer were on hand a half-hour later as Haney climbed to the top of the scaffolding around the copula and stepped off onto the base of the statue. Those who accompanied him to the perch said he waved and gave thumbs up to the handful of people below. Dream big Oklahoma. Work hard. Believe deeply; for this is just the beginning. Let us all rise to our potential, Haney said as he became the last person to stand on the base of the statue, which was on display at the Capitol for Oklahomans to see and touch for six days before Fridays ceremony. 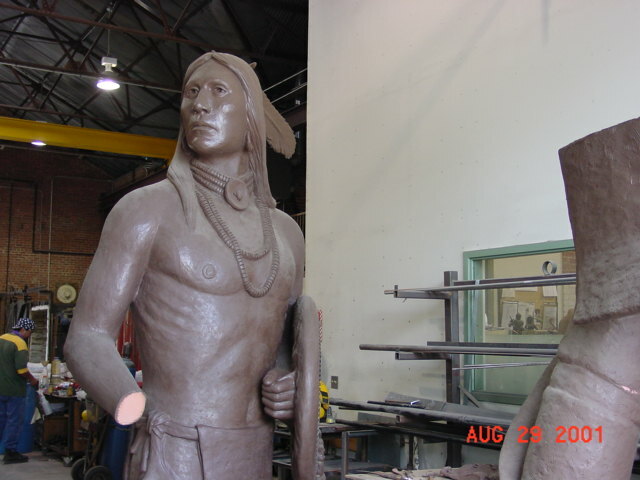 Haney was selected to create that statue for the top of the dome in a blind competition, Oklahoma Arts Council Chairwoman Betty Price said. Kelly Haney, youve made your mark in history, Price told her longtime friend. Haneys visit to the top of the dome capped a morning filled with Native American entertainment and speeches. The Kiowa Black Leggings Society served as the color guard and Native American Anna Jordan sang the national anthem. There was music by the Cozad family singers, a Native American drum and vocal group, and Indian dancers also added to the show. Keating said completing the Capitol with a dome has been his dream for 25 years. He told the crowd that only two Capitol buildings were designed with domes but originally built with­out them - the Oklahoma Capitol and the U.S. Capitol. In 1864, Abraham Lincoln put the dome on the U.S. Capitol as a symbol that the Union would prevail. We are making a statement that we shall prevail, Keating said. It was all far more fanfare than Carolyn Hosmer Pair remembers from July 20, 1914. Thats the day then Gov. Lee Cruce broke ground for the Capitol building. Pair was 12 at that time. Last month, she turned 100 and she was determined to see The Guardian placed atop the Capitol. She missed out, though, on seeing the statue up close and touching it while it was on display on the Capitols north steps. You cant do everything, she joked. The more than $21 million cost of the dome is being paid through private donations.